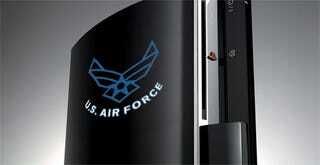 Influenced in no way by the release of a newer, slimmer model, the United States Air Force will soon be placing an order with Sony for 2200 PlayStation 3s. And they're not even going to play games on them! Instead, the consoles will be headed to the USAF Research Laboratory's information directorate in Rome, New York, where they'll be combined with 336 consoles the lab already own to form a "cluster" of Cell chips. A PS3 Rat King, if you will. This cluster will then be put to work grinding out better ways to process high-res radar images, video footage, as well as research on "neuromorphic computing", a term that didn't sound that scary until I looked it up.